Transporting large groups holds its own unique challenges, yet the experienced team at Limo Service Rental specializes in executing arrangements for all varieties of groups and can transport any number of passengers for whatever services you may require. Our large and diversified fleet ensures we’ll have the perfect newer model vehicle to meet your needs and your group will ride in comfort and style throughout your individually crafted itinerary with us. Limo Service Rental aims to keep your transportation costs affordable and the reservation process simple while maintaining our gold standard for courtesy and excellence throughout the transaction. Our dedicated and attentive group service team will ensure meticulous care is given to all pertinent details so that you can rest assured your arrangements are in good hands. Group transportation with Limo Service Rental often begins with a personalized Meet and Greet within the airport terminal. The group is then escorted to a waiting motor coach upon which bottled water and mints are always complimentary. Our knowledgeable chauffeurs are trained to adapt to group requirements and are highly familiar with the best restaurants, attractions, and venues to accommodate the large number of people. Our sightseeing touring coaches feature on board PA systems and overhead monitors and we can additionally provide suitable vehicles for long distance and out of state travel itineraries. Group transportation is popular for church groups, sporting teams, and convention attendees but Limo Service Rental can also arrange custom group transportation for shopping expeditions, meetings and other corporate events, as well as for all the various components of weddings. We strongly recommend that you begin the reservation process early for groups as our large vehicles are often in high demand; however, we will gladly accommodate last minute requests to the best of our ability. Limo Service Rental provides a user friendly online reservations system and our customer service phone reservations center is open 24/7 for your convenience. 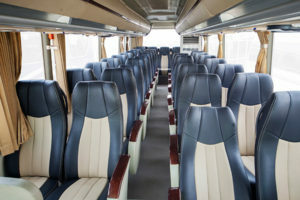 Various sized groups may choose from multiple vehicle options including premium executive vans, luxury model SUV’s, classic and exotic limousines, and buses- both specialty ‘party buses’ and high end motor coaches suitable for road touring. All our vehicles are decidedly roomy and feature comfortable plush seats as well as state of the art electronics systems for your comfort and convenience. Limo Service Rental is pleased to offer highly competitive group transportation rates as well as immediate invoicing for all our accounts. Our extensive vehicle fleet receives regular and expert maintenance, always performed with your comfort and safety in mind. Our professional chauffeurs receive ongoing rigorous training in our core principles of customer service and are regarded as the best in the business. Guaranteed to be ‘on time every time’ and with a standard of the customer’s needs always being of highest importance, Limo Service Rental consistently endeavors to exceed your expectations and to provide an industry-leading quality group transportation experience.